In the 21st century, “Digital Children” (Edyburn, 2002) are growing up in a world rich with technology, including cell phones, iPods, email, PalmPilots, Web sites, discussion boards, chat rooms, the Internet, and electronic toys and learning games (Siraj-Blatchford & Whitebread, 2003). Young children whose families use technology acquire knowledge of and skills in language and literacy in part through exposure to technology in the home (Jewitt, 2006). For example, McGee and Richgels (2006) observed that many young children become aware of the existence of print and its use by their families in their daily lives through screen presentations on the computer, audio feedback from software and websites, and so on. Through multimodal experiences with computers that include images, visual layout, color, sound, and movement, children develop understandings of particular communication events within language based social contexts (Jewitt, 2006). Technology provides tools that can be used as engagers and facilitators of thinking, helping young children construct their knowledge of the world (Jonassen & Howland, 2003, p. 12). 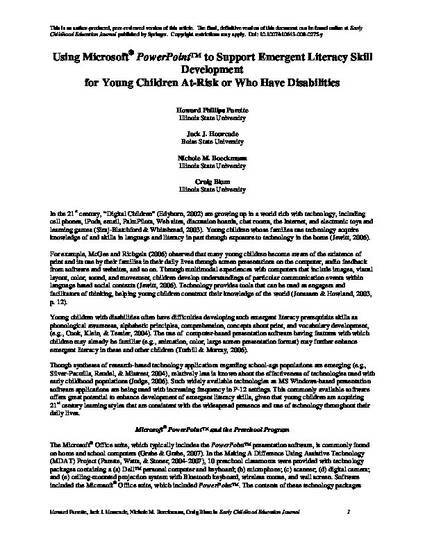 Young children with disabilities often have difficulties developing such emergent literacy prerequisite skills as phonological awareness, alphabetic principles, comprehension, concepts about print, and vocabulary development, (e.g., Cook, Klein, & Tessier, 2004). The use of computer-based presentation software having features with which children may already be familiar (e.g., animation, color, large screen presentation format) may further enhance emergent literacy in these and other children (Turbill & Murray, 2006). Though syntheses of research-based technology applications regarding school-age populations are emerging (e.g., Silver-Pacuilla, Reudel, & Mistreet, 2004), relatively less is known about the effectiveness of technologies used with early childhood populations (Judge, 2006). Such widely available technologies as MS Windows-based presentation software applications are being used with increasing frequency in P-12 settings. This commonly available software offers great potential to enhance development of emergent literacy skills, given that young children are acquiring 21st century learning styles that are consistent with the widespread presence and use of technology throughout their daily lives.